Cosplay tutorials aren’t normally my thing, but I’m posting this one as sort of a public service. Last summer I cosplayed as Weiss from the web series RWBY. 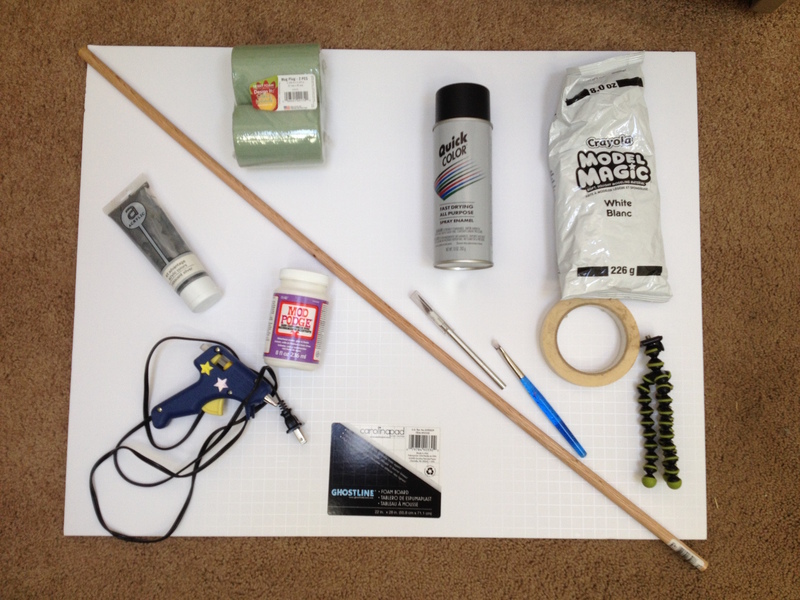 When I was researching Weiss’s weapon for my costume, there was only one tutorial that didn’t require some serious power tools, and it wasn’t quite what I wanted. Having no real woodworking knowledge and certainly no tools, I had to discover my own way. I also had to do it fast – the whole thing was made in one week. So for all the other cosplayers out there who don’t own a table saw, here’s what I did. 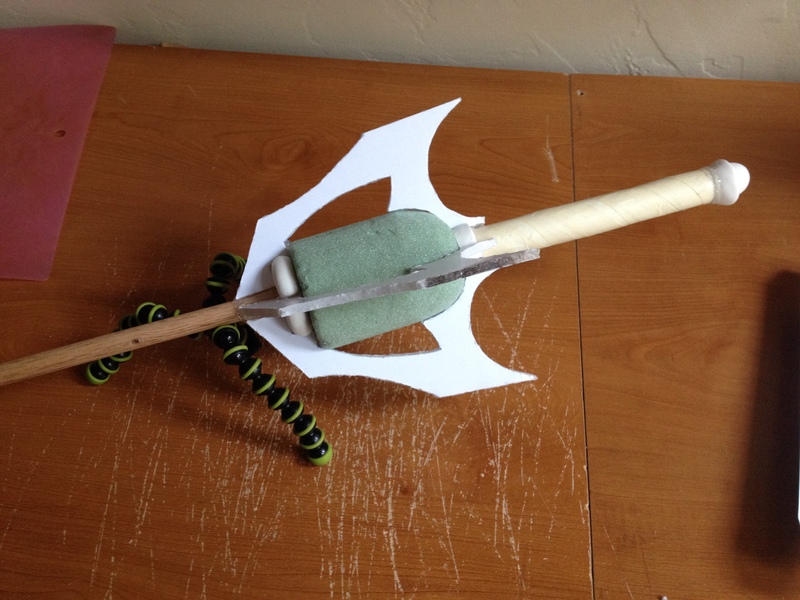 For me the most important part was finding a solid base for the sword that was lightweight and easy to work with. 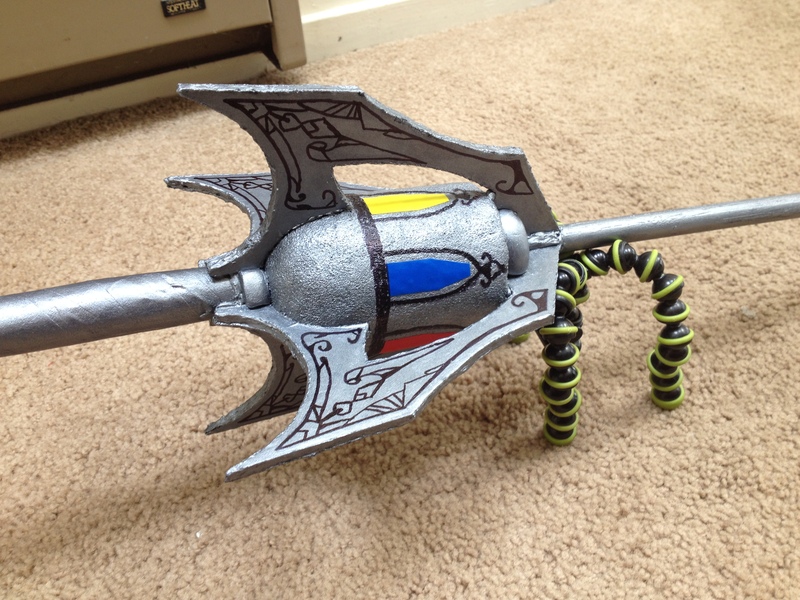 I wanted to make sure the prop would be solid, and wouldn’t break apart the first time I bumped into someone. I wandered around Home Depot for about an hour, picking up various pipes and metal rods and pretending to fence with them. I’m not going to lie, I looked super cool and very sane. Eventually I settled on a 1/2 inch wooden dowel, which I later realized I could have purchased at my local craft store when I went to get the other supplies. Regrets. You could probably use any type of foam for the center dust chamber so long as you can easily carve it. Floral foam is easy to damage, but it is also easy to shape and the mug plug was very close to the correct shape already. I happen to own a peeling knife, which has a curved blade and is perfect for making a rounded end (though any small knife would work). I rounded one end, making small slices until I got the shape I wanted. 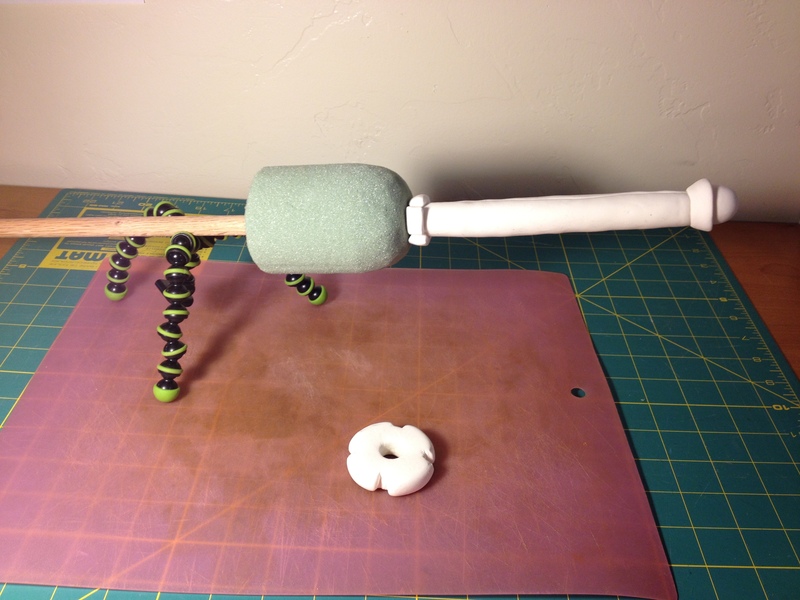 Floral foam is super brittle so it’s not hard to just push the dowel through the middle. Beware that this also makes it easy to accidentally chop off huge chunks or squeeze it too hard, so watch out. You will get tiny foam dust on absolutely everything during this process, so do it outside or next to a vacuum. I’ve used Crayola Model Magic for a lot of projects over the years and I love it. It’s very light weight and hardens by air drying. The thing to remember is that it’s very weak. I would never try to make an entire sword out of the stuff – it would snap in half under its own weight. That’s why I only ever use it as decoration over a strong base (the dowel in this case). I made a ring for both the top and bottom of the center chamber. For each ring I made four notches that I could later stick the wings into. I wasn’t sure how necessary this was at first, but it turned out to make a big difference in how stable the wings were and how nice it all looked. I wrapped a layer of Model Magic around the handle to thicken it up, and added the pommel (knob at the end). I gave my Model Magic at least 24 hours to dry. Once dry, I wrapped a few rows of masking tape at an angle on the handle to mimic a leather wrapping. I tried to make the rows even at first, but gave up quickly because it wasn’t an even surface. It looks the same either way. I also added a bit of hot glue near the end of the handle to ensure the pommel would stay on. 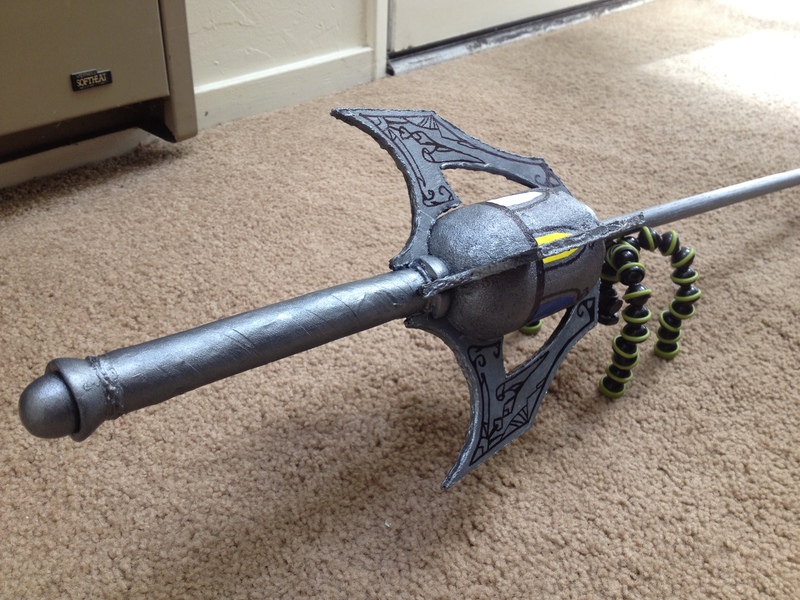 Finally, I added a dab of hot glue to the business end of the sword to make the tip round instead of flat. 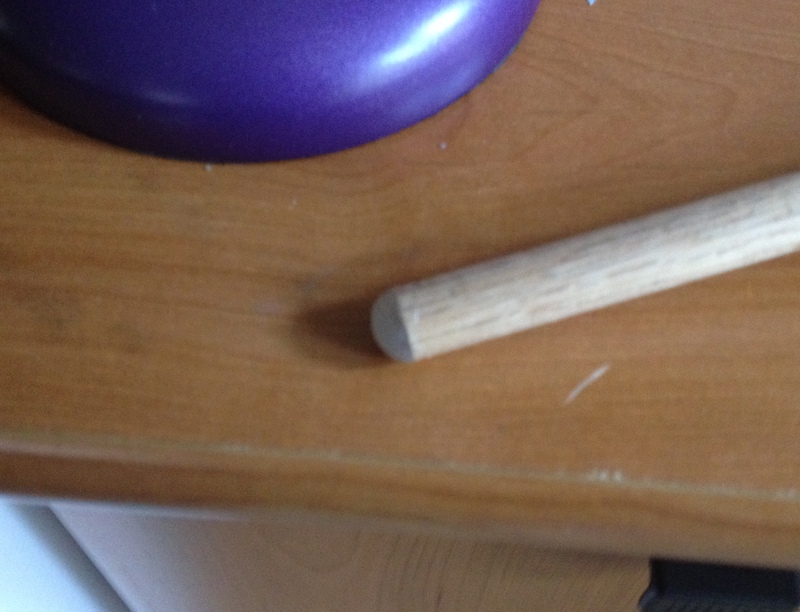 This made a big difference in making the dowel look less like a dowel. It probably made it safer, too. I had a screenshot of the sword wings on my computer, and I resized the image until the printed version was a size-match for my sword base. 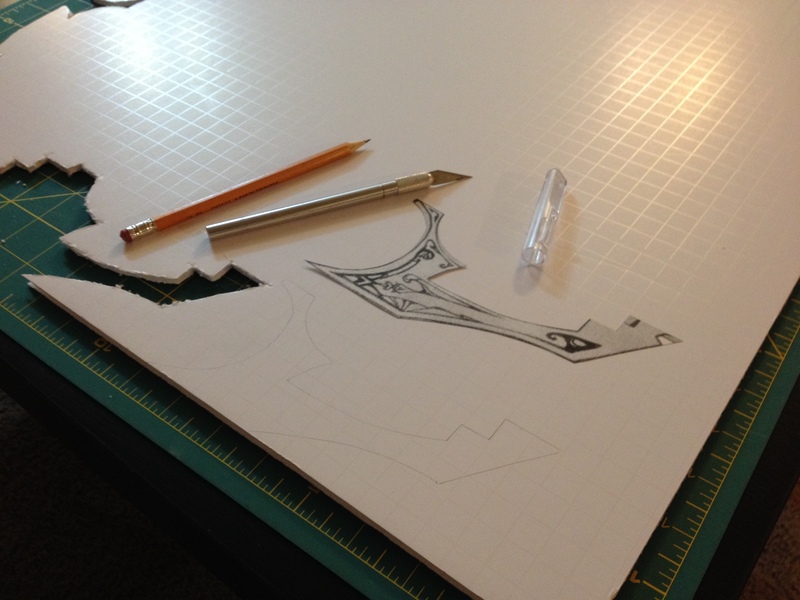 This way I was able to cut the wing shape straight from the screenshot and lay it on top of the foam board to trace. Foam board is annoyingly difficult to cut, and the inner foam breaks apart easily. I’m not sure I particularly recommend it, but I can’t think of any other material that doesn’t require a wood shop and can still hold the weight of the sword. Cardboard or craft foam could work visually, but I don’t think you’d ever be able to let the finished sword rest on the wings, which would be a real pain at a convention. It took a long time to cut the foam board with the Xacto knife. Small bits of foam popped out the sides and made the edge very uneven. I sealed the edges up with hot glue, using the hot tip of the gun to smooth the glue until it was mostly flat. It wasn’t perfect, but it worked well enough. I got better at both the cutting and the gluing as I went. If I were blessed with more time and/or more patience I probably would have re-done the first wing. But here we are. Once the wings were all cut and the edges sealed with glue, I attached them to the sword with more hot glue. This is where it became clear that I had made the right choice by leaving notches in the Model Magic circles. The wings fit in perfectly, with the notches covering up most imperfections. I added a bit more glue to seal up the edges and make the surfaces as smooth as possible. I let the glue dry overnight, then I spray painted the entire thing black, doing one half at a time to avoid smudging/getting spray paint all over my hands. 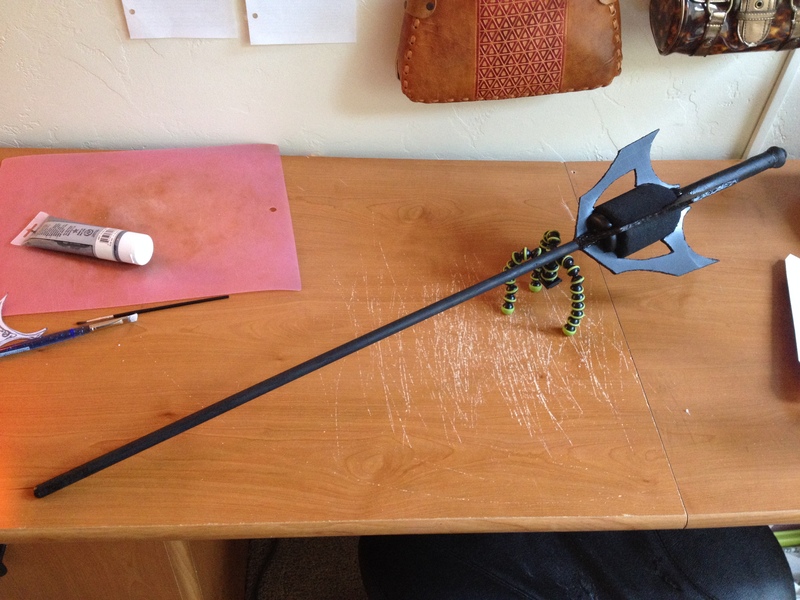 The black ensures an even look, and a solid base coat gives a lot of depth to metal props. I let it dry for a day, then I began the slow process of painting it silver. I used Iridescent Silver from Art Advantage, but any acrylic metallic silver should work. It works best to dry brush – applying a bunch of thin coats on top of each other until you’ve got the color you want. You can usually do several coats at a time because by the time you’ve finished the forth wing the first one is dry enough for a new coat. However there is a limit to this. After a couple coats the sword will be too damp and new paint will start wiping away old paint. Plan to have 3-4 painting sessions with several hours in between each session. The hardest part of painting was the foam cylinder in the center, because it was inclined to fall apart when wet. Be careful with it. Were I doing this again, I would consider spraying the foam black as soon as it was shaped, then using Mod Podge or a clear coat spray to seal it before attaching any other pieces or doing any other work. Regrets. It worked fine either way, just don’t look at it too close. After the whole thing looked sufficiently silver, I did about three coats of Hard Coat Mod Podge. Not only does it keep your paint from scraping off, but it makes your prop much more rigid. Mod Podge dries pretty fast so you can get all three coats on in one evening if needed. A true perfectionist might sand down the final coat to make it extra smooth and shiny, but I didn’t have any sand paper and I’m trying to be less of a perfectionist. For the dust cartridges I cut out pieces of colored electrical tape. I still had that perfectly sized paper printout of the sword, so I made a template from that to ensure each cartridge was the same. Spacing the tape was weird, because it’s six colors on a cylinder that’s been divided into four sections. If you’re using paint instead of tape, I recommend painting white pieces of paper and gluing them on rather than trying to paint directly onto the cylinder. This allows you to adjust the spacing easily, and ensures the colors stay bright. I was nervous about the designs on the wings as I’ve never been good with freehand drawing. I used a regular black Sharpie and drew directly onto the sword. The lines around the cartridges weren’t so bad since they were symmetrical and outlined the colored tape. The pattern on the wings was pretty complex though. Once again I had my printed wing as a starting point, but I knew just trying to copy the whole thing was going to result in an uneven disaster. Instead, I picked only a few lines at a time, and drew them on both sides of all four wings before moving on. This way I could think about each line in terms of start and end points rather than trying to draw what I saw. I started with the lines nearest to the edges since they followed the contour of the wings, and moved in piece by piece. I also focused first on the bigger, primary shapes and only added the little pieces after I’d finished the big parts on all eight sides. There were times when I was drawing a single, short line on all eight sides before drawing the next thing. I did a final coat or two of Mod Podge over the electrical tape since it’s notoriously not sticky, but other than that, it was done! The whole project took exactly one week, working on it almost every evening and most of the two weekend days. The GorillaPod isn’t a requirement, but it certainly made the painting and drying easier. Plus I wouldn’t recommend having the sword rest on the wings more than necessary, especially before the Mod Podge is on. I’ve never considered myself much of a prop person, so I’m really proud of this one. It held up well, looks great in photos, and now lives on the mantle in my living room because I don’t know where else to store a sword.